In general, the inputs of sound cards take 1/8 inch stereo mini-jacks. 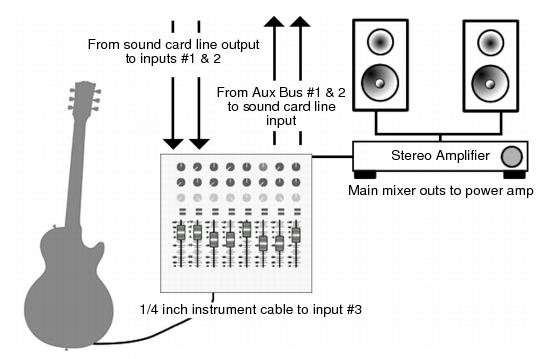 Sound cards usually have two inputs—one for line level inputs and the other for microphones (at mic level). The line level input is stereo; the mic input could be either stereo or mono. If your final output does not terminate in a 1/8 inch jack (and it probably doesn’t), you will need an adapter to plug it into your sound card. Most sound cards use the Windows Volume Control to adjust the master input and output volumes and to control which recording inputs are active. If you don’t hear audio tracks, or if you can’t easily control the audio volume in Cakewalk, go to Control Panel > Hardware and Sound > Volume Control (Windows 7) and check the settings there. See your sound card’s documentation for more. The 1/8 inch jack should be plugged into the sound card’s mic input, although plugging into the line input may also work. This diagram assumes that the output of the rack is at line level. If it is at pro level instead (+4 dB), and your card does not accept a +4 db input, you will need to attenuate (lower) the F/X rack’s signal. To do this, use a mixer between the rack’s output and the Y-adapter. If the rack has only a mono output, a 1/4 inch mono to 1/8 inch stereo adapter should be used instead of a Y-adapter. 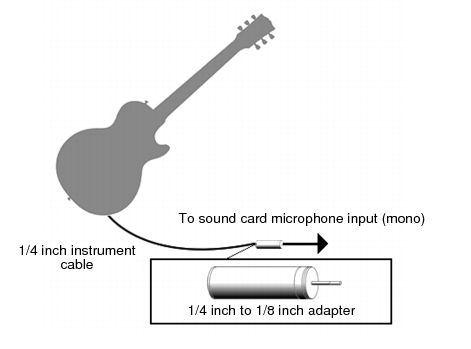 If you want to connect a guitar amplifier’s direct output to the sound card, you should base your setup on this example. If you are using your computer’s internal CD player, and it does not have its audio outs connected internally to the sound card, run a cable from the CD player’s Headphone jack to the card’s Line In jack. If there is no Headphone jack, you’ll need to use an external CD player. Note: If your mixer has buses, use them! This helps to avoid feedback.